Atlanta, GA–(ENEWSPF)–June 7 2016. 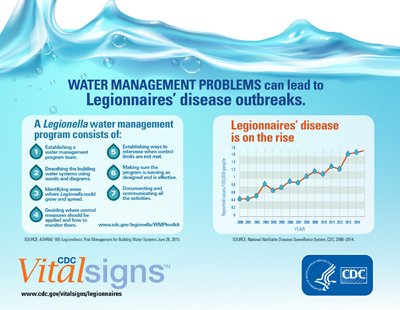 More effective water management might have prevented most of the Legionnaires’ disease outbreaks CDC investigated from 2000 through 2014, according to today’s CDC Vital Signs report. Legionnaires’ disease is on the rise. In the last year, about 5,000 people were diagnosed with Legionnaires’ disease and more than 20 outbreaks were reported to CDC. Legionnaires’ disease is a serious type of lung infection (pneumonia) that people can get by breathing in small droplets of water contaminated with Legionella. Most people who get sick need hospital care and make a full recovery— but about 1 in 10 people will die from the infection. About 2 in 3 (65 percent) were due to process failures, like not having a Legionella water management program. About 1 in 2 (52 percent) were due to human error, such as a hot tub filter not being cleaned or replaced as recommended by the manufacturer. About 1 in 3 (35 percent) were due to equipment, such as a disinfection system, not working. About 1 in 3 (35 percent) were due to changes in water quality from reasons external to the building itself, like nearby construction. CDC today released a new toolkit for building owners and managers: Developing a Water Management Program to Reduce Legionella Growth & Spread in Buildings: A Practical Guide to Implementing Industry Standards. Based on ASHRAE Standard 188, a document for building engineers, the toolkit provides a checklist to help identify if a water management program is needed, examples to help identify where Legionella could grow and spread in a building, and ways to reduce the risk of Legionella contamination. Most healthy people do not get Legionnaires’ disease after being exposed to Legionella. People at increased risk of Legionnaire’s disease are 50 years of age or older and have certain risk factors, such as being a current or former smoker, having a chronic lung disease, or having a weakened immune system. For more information on today’s Vital Signs, visit www.cdc.gov/VitalSigns. For more information on Legionella, Legionnaires’ disease, and the CDC toolkit visit www.cdc.gov/legionella. Toxic Chemicals Found in Kids’ Makeup Products – What Will You Shop for This Halloween?